‘Tis the season to be jolly—ha ha. But I have discovered something to help you ho-ho through the holidays. These puffy, chewy, zesty, bite-sized golden cheese puffs are my newest appetizer and holiday gift. Less than 10 minutes prep. Throw the ingredients into the blender and transfer them to mini muffin tins to bake. They hold up amazingly well. Are good hot or at room temperature and can be frozen. You can be creative with the cheese and seasonings. They are terrific for toting. Bring them to every party. For gifts, you can put them in a tin or in the cookie bags they sell at hobby shops, like Michaels, Or, for a fancier gift, include them in two nonstick mini muffin tins. No matter how you pack them. be sure to include heating directions, 375 degrees F for 7 to 10 minutes. You might also like to include the recipe. So, move over cookies. Let everyone else bring cookies, breads and cakes. You and I will be remembered for these tasty, creative and healthier cheese puffs. Feel free to vary the cheeses. Be sure to use nonstick mini muffin tins that are 1 3/4 x 1 inch deep. They gloriously rise up over the tops. 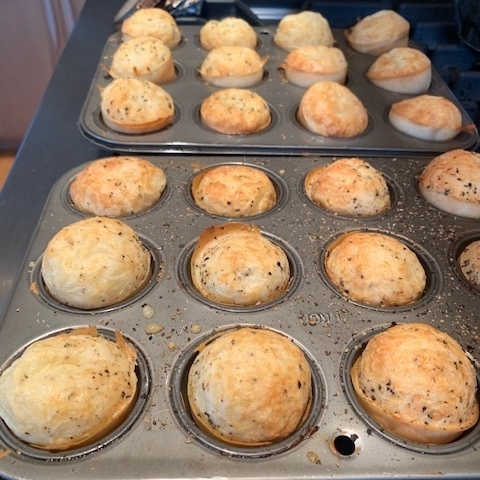 Arrange rack in middle of oven and preheat the oven to 400 degrees F. Spray 24 mini muffin tins that are 1 3/4 x 1-inch deep with non-stick coating. Pour all ingredients but 2 tablespoons cheese for topping in a blender and combine until smooth, about 2 minutes, scraping the sides of the bowl as needed. Divide the batter evenly among the cups. If it is too thick to pour, transfer to a bowl and spoon the mixture into the cups, filling half full. Sprinkle remaining cheese over the tops. Bake until the puffs are well risen and deep golden brown, 15 to 20 minutes. Immediately transfer puffs to a wire rack and let them cool for 3 minutes. Remove from tins. Serve warm or at room temperature. To make ahead: Puffs may be stored airtight at room temperature for 2 days, refrigerated for up to 2 days or frozen. You do not need to defrost them before baking. Before serving, if at room temperature, reheat on baking sheet at 375 degrees until hot, 7 to 10 minutes. If frozen, bake 3 to 5 minutes longer. Stir I teaspoon finely chopped rosemary into the batter or sprinkle some on top of puffs or both. Stir in freshly ground back pepper or sprinkle some on top or both. Substitute Stilton or another firm blue cheese for the Parmesan and add ½ tsp. ground black pepper to the blender.